warm Rumor during months the finally becomes reality. 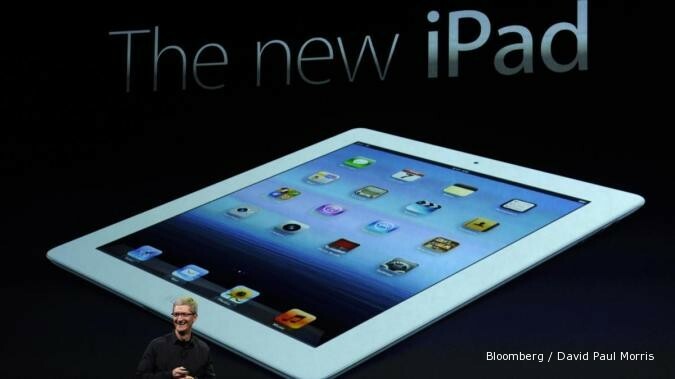 Apple officially has announced iPad third generation as router iPad 2. This device finally is named without addition frill. Phil Schiller, division leader marketing Apple getting duty to explain newest fitur in iPad 3. One of them is existence Retina Display, this display screen presents resolution 2048 x 1536 pixel or around 3.1 million pixel the biggest for a device mobile. With a resolution 2048 x 1536 pixel, iPad generation to this 3 simply has 1 million pixel more than a HD TV 1080p and saturation 44 % bigger. Spalling facility to from resolution as high as that, Apple will apply new processor chip that is chip A5X. One of new fitur for iPad generation to 3 is a camera system. At backside camera from " The New iPad" will apply sensor 5 megapiksel, with technological support from and fitur like Backside illumination, 5 element of lens, filter Hybrid IR, Apple-designed ISP, iSight camera, autofokus and white balance, and detection of face. Video sector also will present technology capable to record quality of 1080p HD, with stabilization support from of video, reduction of noise whereas at video, and it is of course ability of video with display retina. For camera in frontage which commonly use for video conference and or web chat, Phil Schiller only limited to explaining that iPad generation to this 3 will apply newest iSight camera without adding any description for characteristic specially owned from this camera. * Display Retina: Resolution 2048 x 1536 pixel with compaction of 264 pixel per inch. Mean, the display closing print display / magazine if it is seen from distance 15 inchs. * Processor A5X: Processor applied is Apple A5X, what has dual core processor and graphical processor four cores ( quad core). the strength is claimed 2 times more Tegra 3. * Camera 5MP: the camera is more or less similar to applied in iPhone 4S, only the ability 5MP and non 8MP. * iSight: The back camera called iSight, has ability to record video 1080p 30 fps. * Non Siri: iPad has just owned ability to dictate email and others. the technology is possible similar to Used in by Siri. * LTE: newest iPad has supported ability of network 4G LTE. For user in Indonesia, this news disregarded formerly just until the network is available here. * Availability: This device will available of next week, starts 16 Marchs 2012 in United States, Canada, English, Prancis, Jerman, Swiss, Jepang, Hong Kong, Australian and Singapore. * Price: the price range is 499 dollars AS ( 16GB), 599 dollars AS ( 32 GB) and 699 dollars AS ( 64GB). There is costlier price for capable iPad of 4G.